We continue to perpetuate poverty by the way we define it. Treating economic poverty as a condition has never reduced it because this approach does not consider the affected individual as an actor and addresses only the symptoms affecting him. Too many otherwise intelligent people perpetuate economic poverty by confusing it with the deprivation that it causes. As in Lyndon Johnson’s misdirected “War On Poverty”, appeasement and electioneering result in shortcut feel good legislation that attempts to reduce only deprivation. A classic example is the FHA 235 program of the 1960’s where the only permanent results are the green spaces in the old ethnic neighborhoods. Confusing economic poverty with deprivation perpetuates economic poverty and constrains millions into embarrassing dependency on government charity. Treating the "poor" as victims of the "rich" is totally mis-directed and counterproductive. Defining poverty as a condition would imply a permanent requirement for dependence and charity and never leads to a holistic strategy for poverty reduction. Wikipedia's definition of poverty runs for about four pages enumerating every conceivable form of deprivation. All of it is completely annotated. All of it is completely wrong!!! The true definition of economic poverty is the inability of the individual to create value for himself and for others. Value creation is the satisfying of needs or wants of individuals and organizations. In essence, most value creation is in some way service to others. Whether as an individual or as a nation, when more value is consumed than created, capital is surrendered. If capital is not available, then debt will be incurred. If debt cannot be incurred, deprivation will result. 1. A sense of positive persistence. 2. Knowledge of ways to create legitimate value. 3. Enterprises that provide the tools with which to create value. 5. Security of rewards and security of person. Establishing priorities, setting goals, formulating policies, growing public promotional organizations, enacting legislation, creating regulations, and promoting individualism to improve these five resources will provide the only possible holistic approach to reducing economic poverty. 1. A Sense Of Positive Persistence: We need to instill in our children that their long-term happiness is related to their future ability to create value and the most valuable resource enabling value creation is a sense of positive persistence. You can refer to Calvin Coolidge’s famous quotation. Cultural capital from parents, family, associates, and neighborhood is essential. With a 74% illegitimacy rate, our black citizens have a tougher time without the love, guidance, and discipline of fathers. Our kids should be provided with a learning environment of more than one problem-solving project at a time that they can develop a passion for. And then let them alternate between these projects if solutions do not come immediately to encourage them to actually create problem-solving ideas and score higher on Torrance’s creativity testing. They should be conditioned to persistently strive to accomplish goals because their emotional reward will be the internalized feeling of adequacy and self worth. They will learn that all great things are accomplished in spite of difficulties. They will earn the ability to shrug off disrespect as they develop earned self-respect. They will learn that unearned cheap accolades will always prevent genuine self-respect. They should learn about Maslow’s need hierarchy and the power of delayed gratification and intermittent rewards. The Entrepreneurial Leadership Institute, E-City, Y.O.U., and Junior Achievement organizations help our youth to venture into value creating activities while most still have the security of family support. The First Tee is another organization dedicated to building positive character using the game of golf as a vehicle for teaching core values. These organizations and others should be used as resources to the greatest extent in building character and demonstrating the essential importance of positive persistence in value creation. Our kids should also be taught negotiating skills so that they can fairly benefit from the value they create. 2. Knowledge Of Ways To Create Legitimate Value: Knowledge is the sum of education, training, experience, and associations. Education is the starting point and yet we allow under education from over-consolidated school districts where graduation rates are less than 50% and where the primary beneficiaries are the administrators and the unions. Over the last sixty years, public school educational attainment levels have declined as school districts consolidated and teachers’ advocacy organizations morphed into teachers’ unions. Today’s controversial “common core” simply acknowledges this decline. There is absolutely no economy of scale in 50% graduation rates. We should deconsolidate all large urban school systems into smaller neighborhood systems with no more than 10,000 kids each. Smaller school systems have fewer levels of bureaucracy and are more responsive and approachable for parents. We should offer State wide public vouchers so that the districts can compete head to head for enrollment and drive the continuous improvement of educational attainment. This would reduce the need for charter schools. The State would have to subsidize differences in per-student funding between districts. Most failing school districts are already heavily state subsidized and spend more per student than more successful districts. Subsidizing vouchers would be less expensive than the long-term costs of welfare and incarceration. Rules for transfers between districts would include maximum annual enrollment changes, moving schools into adjacent districts, transportation costs, allowed residences, and student return policies. We would not be insanely prosecuting parents for trying to sneak their children into better school districts. We also need to reduce Federal regulations and mandates that can complicate the educational process and usurp State and home rule prerogatives that can stifle experimentation. In our school counseling, we should focus adequate importance on essential higher value creating careers in skilled trades that match market demands such as designers, machinists, tool and die makers, electricians, welders, carpenters, and other skills where many are presently in short supply. Every high school should again have its own industrial arts department to give all of our kids some ability to make things with their own hands. The most politically difficult policy would be to provide special and entirely separate resources for the kids who disrupt, threaten, and violate the rights of those who want to learn. We need to consider establishing academies for children at risk who live on the street in a feral environment. These academies would house, feed, educate, and mentor youth who are disadvantaged and at risk because of a lack of parental support and discipline. 3. Enterprises To Provide The Tools With Which To Create Value: Either the individual creates value within someone else’s enterprise or he creates value within his own enterprise. The primary cause of the shortage of higher value creation enterprises is the trade deficit reducing the demand for about 70 million jobs by bleeding more than $700 billion in capital offshore every year. The absence of taxable wages for 70 million wage earners causes national “reverse tariffs” of more than $530 billion in reduced individual Federal income taxes, $350 billion in reduced Social Security taxes, and $50 billion in reduced Medicare taxes for a total impact of $930 billion in reduced Federal revenue. Including $219 billion in reduced corporate income taxes, this all adds up to a $1.1 trillion in a reversed tariff of reduced Federal revenue from a trade deficit of $700 billion. Added to this is the $226 billion reduction in State personal income taxes with additional losses of State corporate income taxes. This is why the States are hurting. It seems that every dollar of trade deficit reduces combined Federal and State revenue by about two dollars. The 2011 trade deficit was 46% energy and 41% China. It has been reported that we have more than 90 million working age adults no longer engaged in the economy and this has made our wage earning tax base too small to support the present level of Federal spending. As a result, we have a hollowed out economy that has created a lot of personal tragedy for many families. We blindly subscribe to the efficiency and lower costs of "Free Trade" without understanding the real costs of trade deficits and the imbalance of international markets that are skewed against our domestic market. Over the last twenty years, the accumulated trade deficit and the accumulated Federal deficit have tracked parallel to each other as capital bleeds out of our nation. It seems that we are just beginning to wake up to the danger of the “new world economic order” as value consumption exceeds value creation in many national economies such as the U.S. and Greece. The hard lesson here is that free trade is only free when it is balanced. Whether as an individual or as a nation, when more value is consumed than created, capital is surrendered. If capital is not available, then debt will be incurred. If debt cannot be incurred, deprivation will result. 4. Hygiene/Health: The individual must have a place to live, bathe, and eat. The individual must be healthy to be unencumbered to create value. The Affordable Health Care Act, although 52 times the length of our Constitution, deals directly with only the 15% of health care costs associated with insurance overhead. This bill was fixated on the issue of coverage and neglected to deal with the 85% of health care costs drivers associated with the providers. We can make healthcare more affordable only by changing the present business model where our bodies are held hostage and there is no possibility of making choices based upon up-front knowledge of a la carte prices and medical competency. We need legislation that requires all healthcare providers to list their services and fees for services on a single website and then track their history of outcomes versus prognosis. We need nurse-practitioners and doctors acting as ombudsmen to assist individuals in making healthcare decisions based upon diagnosis and published competitive costs and outcomes. Cost containment due to head to head competition through upfront transparency is the only way we will avoid rationing caused by a shortage of healthcare providers that are dis-incentivized by a socialistic single payer system as exists in Canada. We also need to reform the laws governing jury award decisions that drive up medical insurance rates that then drive practitioners out of private practice and into large institutions. Dementia is the single largest cost driver for Medicaid and is the single largest driver of increases in health care costs. Yet we never hear any legislator, governor, or president call for increased or better managed research to reduce the prevalence of geriatric dementia. We could spend 500 billion dollars on dementia research and if successful it would be the bargain of the century. Individuals can also be encumbered by the responsibility of care giving to children, parents, and significant others. These individuals should be provided with sustaining resources during the time that they are caregivers. We need to provide loving care and support for those physically or mentally unable or too young or too old to create value. But their numbers will require a fraction of the financial load that our value creating taxpayers now support to reduce deprivation. 5. Security Of Rewards And Security Of Self: The lack of security of rewards dooms socialism every time. Socialism looks upon poverty as a condition rather than as an inability and the lucky value creators must share with those who are unlucky and cannot or will not create value. Again, in the long run, income inequality results from the inequality of value creation. It is a fact that the top 10% of wage earners in this country already pay more than 70% of all income taxes and that is simply not fair and it is not productive. We could increase the top rate from 35% up to 50% and it would only cover about 21% of the Federal deficit and it will definitely kill the goose. We have the highest corporate income tax rate in the world and because of it we have the lowest corporate tax revenue as a percentage of GDP in the world. This has resulted from the offshoring of jobs and headquarters to countries with lower tax rates. This fact alone should be a call to action. We need a simple and absolutely fair flat income tax for both individuals and corporations with no exceptions and no special economic incentives that tinker with markets. This would also eliminate about two-thirds of a massive, value consuming, and often abusive IRS bureaucracy. The lack of security of self and the fear it creates and the precautions it mandates can trump all other priorities and limit or prevent value creation. The United States has a population of about 318 million and less than 680,000 non-federal peace officers. With these officers on four crews covering three shifts, with vacations and time off, there is about one first response officer on duty for every 2000 citizens. We have a very thin line of security that cannot be in all places and cannot protect everyone. The Supreme Court has already ruled that the primary duties of peace officers are to maintain order and enforce laws. They are under no legal obligation to protect individual life. Therefore the individual has been put in the position of having to assume responsibility for most of his or her own security against the psychopaths and miscreants of society that government seems powerless to identify and remove before the fact. Consequently we now have more than eleven million citizens with a sense of duty to help deter violent crime by qualifying to legally carry a concealed handgun. About one in every 21 adults is now able to protect themselves and those around them and all “un-policed gun free zones” that prevent concealed carry are becoming more asymmetrically dangerous. Because of emotional and irrational hoplophobia, gun free zones filter out and incapacitate those with good intentions and cannot possibly stop those with bad intentions. The decrease in violent crime since 1991 has occurred at the same time that the number of States enacting shall issue concealed carry laws has increased from eight to forty-four. The writer has personal experience in deterring a violent assault in downtown Cleveland. He can legally provide some deterrence to violent crime in 34 States but why not 50? 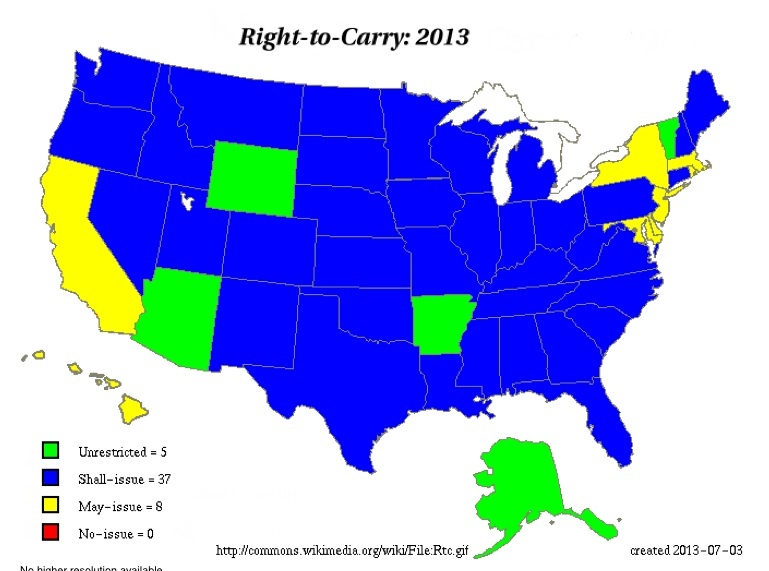 There is a genuine need for a nationwide concealed carry reciprocity law similar to Ohio’s. And it is way past time to decriminalize the addiction to dangerous hard drugs and provide mandated withdrawal treatment. Then concentrate on their elimination by legalizing and taxing marijuana and eliminating two thirds of the financial drivers for corruption, violence, and turf wars that have caused the business killings of thousands of people on both sides of our southern border. Unlike ending the prohibition of alcohol, we do not need a Constitutional amendment to accomplish this. About 500,000 people in the U.S. die every year from nicotine addiction. Yet due to the potential for a black market, as occurred during alcohol prohibition, we do not see any support for tobacco prohibition. Yet this same logic eludes those who want to prohibit marijuana. So the real question……is the potential for some voluntary brain damage a lesser evil than the black market violence and massive incarceration rates caused by prohibition? In conclusion, we desperately need a clearly focused holistic approach to poverty reduction that starts with its true redefinition in the public lexicon. Naturally there will be differing opinions regarding the content, approach, and priorities associated with each of the five necessary resources and books could be written about each. But all of this will stimulate constructive dialogue as we focus on a concerted effort to increase individual value creation and improve the quality of life for millions now relegated to embarrassing dependence.